Out of the key barriers to a more integrated and fluid capital market in the EU is the lack of trust between national competent authorities and between market players. More integrated supervision can help address this issue which is a structural impediment to cross-border investment and some changes to the governance of ESMA could help ESMA to better perform its tasks. In addition, differentiation may be warranted as regards the role and potential adjustments to the framework in which each ESA operates. The public consultation on the operation of the ESAs which was launched by the Commission in March is the opening step for optimising the role of ESMA in ensuring effective and consistent capital market supervision. Europe needs capital markets which are available, accessible and affordable. CMU is not about a one size fits all approach: there is a need for targeted responses depending on the market segments and the size and risk profile of market players. The cost of regulation for smaller entities should be taken into consideration. Reducing the regulatory burden on smaller entities in order to allow them to operate is now necessary. The need for a more proportionate approach in regulation is even bigger in smaller markets and local ecosystems. Post-trading is a key dimension of CMU affecting the whole trading chain. There are outstanding Giovannini barriers, as well as more recent sources of fragmentation in post-trading whereby action is overdue. The potential of distributed ledger technology (DLT) is very high, but too many issues remain today to see it as a panacea to post-trading challenges. The departure of the UK from the single market reinforces the need to focus on supervisory convergence to eliminate regulatory arbitrage and a race to the bottom. However, some of ESMA’s supervisory tools are too weak to ensure convergence, especially those set out in sectoral legislation. For example, ESMA’s ability to collect information should be improved and the scope of breach of Union law powers clarified. A strategy on data will also be a key element for an improved functioning of the single market for capital. Despite the increased provision of cross-border services, we have not seen a change in the way supervision is carried out. A more consistent approach to achieving financial stability, investor protection and orderly markets is now needed to help remove the current barriers to investment. If we are not to undermine investors’ interests, exploring ways on how to better perform supervision of cross-border operations is crucial. 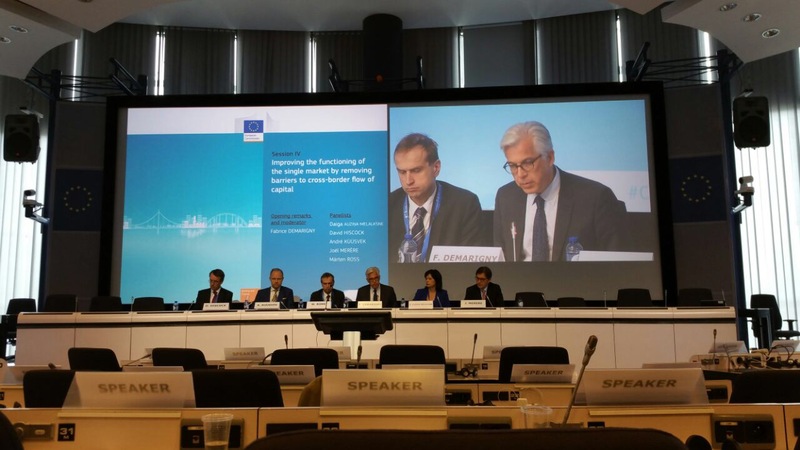 Fabrice Demarigny, a Partner and the Global Head of Financial Advisory Services and Capital Markets Activities at Mazars, moderated one of the thematic panels at the public hearing on the “Capital Markets Union (CMU): mid-term review” on April 11 2017, organized by the European Commission. The event was web-streamed and the webstreaming is available here. Fabrice Demarigny is the Global Head of Financial Advisory Services and Capital Markets Activities at Mazars. Fabrice worked for eleven years in the French Securities Market Authority (AMF) where he was member of the Steering Committee of the College of Supervisors of Euronext and one of the drafters of the IOSCO Principles of Securities Regulation. In 2002, he has been appointed the Secretary General of the Committee of European Securities Regulators (CESR – today ESMA). During his tenure, he contributed to the adoption of all EU Directives and Regulations regarding Markets of financial instruments (Mifid), Prospectuses, Transparency obligations of listed companies, Takeover bids, Market Abuse and UCITS. In 2008, Fabrice became a member of Mazars’ international partnership and a Partner of the Law Firm member of Mazars in France. He is currently the Managing Partner of Mazars Société d’Avocats and the Global Head of Financial Advisory Services and Capital Markets of Mazars’ group. At the request of the French Minister of Finance, he published a report for an “EU listing Small Business Act” (2010 – Mme Christine Lagarde) and “25 Investing and Financing Recommendations for the forthcoming Capital Markets Union” (2015 – Mr Michel Sapin). In 2012/13, he chaired the Strategic Committee for Small and Midcaps of Euronext that lead to the creation of Enternext. Fabrice is the founder of Securities Lawyers Association (ADB) and is currently the Chairman of the European Capital Markets Institute (ECMI) as well as member of the Steering Committee of Paris-Europlace. A French attorney, PhD in Political Sciences, he is a graduate in Law and Economics. He is knight of the French National Merit Order and of the Légion d’honneur.